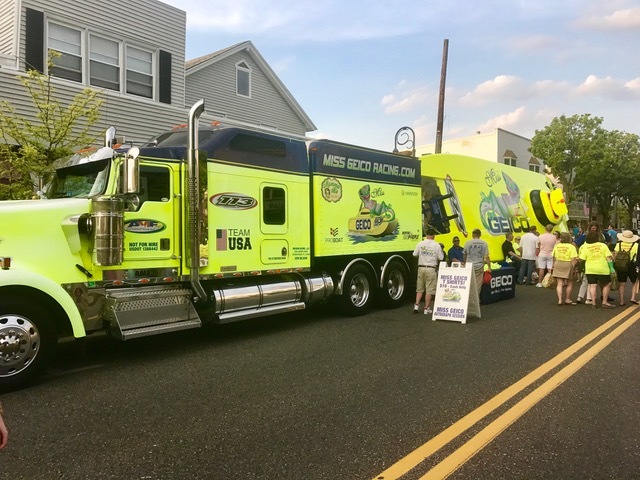 We unveiled the newly painted Miss GEICO Race boat this past weekend in Point Pleasant, NJ. We had a street party on Friday evening, a great test session followed by a street parade (we had the Mayor and several commissioners on the race boat) on Saturday. This weekend we are participating in the National Salute to America’s Heroes Air and Sea Show in Miami Beach. They are expecting over 500,000 people. Our next real test with the race boat is in Sarasota June 30-July 2, 2017. We will see how our engines hold up in the hot and humid weather. Moments ago, Mercury Racing general Erik Christiansen and his team pulled the sheet off the new 1650 Race engine in the company’s booth at the 2013 Miami International Boat Show. Based on the same quad overhead cam, 32-valve twin turbocharged 1350- and 1100-hp offerings, the 1,650-hp powerplant is most powerful production offering in the history of the Fond Du Lac, Wis., company. It is not, however, simply a 1350 that runs on 112-octane race fuel. Notable changes to the QC4v platform include larger turbochargers, complete computer remapping and recalibration and upgraded oiling systems. The 1650 Race is the most powerful prodution engine Mercury Racing has ever offered. In addition to upgrades to the engine, Mercury Racing upgraded the M8 drive, which has a hydraulic transmission, that puts the power to the water. Specifically, and means the company added rear bearing support near the output flange to support the drive flange, according to Christiansen. The 1650 engines will be available only to “qualified” professional offshore racing teams next month. And the first team is none other than Miss GEICO racing. The engine program deal between Mercury Racing and the GEICO team was completed late yesterday afternoon. “This is more than just the best-known offshore racing team running the latest and greatest power from the world’s leading high-performance marine engine builder,” said Marc Granet, the driver for the Miss GEICO catamaran. “This is two 825-pound gorillas teaming up to form one 1,650-pound gorilla. Team GEICO’s Scott Begovich and Marc Granet will run Mercury Racing 1650 engines this season. The Mercury Racing-Miss GEICO news comes on the heels of the Qatar Marine Sports Federation’s announcement (Read the story) that it wants to establish a Ryder Cup-style offshore racing team competition between the two Qatar-backed boats and any U.S.-based boats on the Super Boat International circuit this year. While Granet and Miss GEICO throttleman/teammate Scott Begovich have not yet run a boat with 1650 Race engine power, renowned offshore racer John Tomlinson has. At the end of last season, Tomlinson throttled Gasse a 48-foot Marine Technology, Inc., catamaran, with a pair of prototype 1650 Race engines under the hatch. He said the new powerplants have similar low-speed manageability characteristics to their 1350 siblings—and outstanding power throughout their operating range. Though Christiansen emphasized that the 1650 is targeted at and will be sold to professional offshore racers, the engine could, at some point, find its way into “pleasure” use. However, at present Mercury Racing is not selling the engines to anyone other than racers. “I imagine it will get out there at some point, maybe when racers end up selling it, but at this point we are trying to keep it to the racers,” said Christiansen.